The Catholic Central girls basketball team is off and running. Under second-year coach Joe Spierenburg, the Hilltoppers tipped off the 2018-19 season with convincing back-to-back non-conference victories. They toppled University School of Milwaukee, 55-28, on Friday, Nov. 16, and then cruised to a 49-17 victory over Milwaukee Obama SCTE less than 24 hours later. Catholic Central was slated to host Living Word Lutheran on Tuesday, Nov. 20 – one of five consecutive home games to start the season. A victory would give the Hilltoppers their best start since 2007 when they won their first four games as Carol Henney and Alexa Deacon led the team to a 19-5 record and a trip to the WIAA sectional. 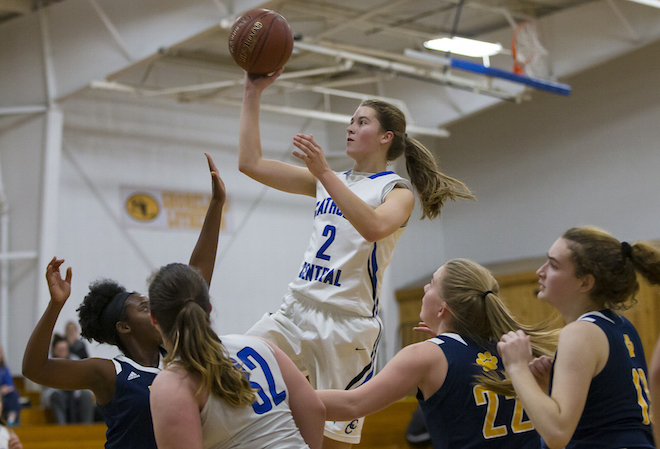 In the season-opening victory over University School, senior returning starters Elizabeth Klein (16 points), Emma Klein (15) and Erin Schwenn (13) all scored in double figures as Catholic Central broke the game open in the second half. The Hilltoppers shot 48 percent from the floor, including 51 percent from inside the 3-point line. In the victory over Milwaukee Obama the next day, Emma Klein led the way with 14 points thanks to a 6-for-6 effort from the free-throw line. Elizabeth Klein added eight points and freshmen Morgan Ramsey and Madeline Von Rabenau chipped in six and five points, respectively. Other returning players who saw varsity action last season are senior Ellie Nevin and juniors Isabelle Phillips, Mia Sassano and Abigail Sheehan. Julia Klein joins Ramsey and Von Rabenau as the third freshman on the 10-player varsity roster. To read the entire story see the Nov. 22 edition of the Burlington Standard Press.